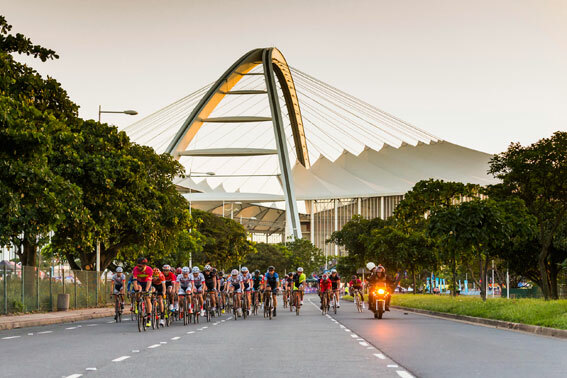 The ever-increasing number of keen road cyclists training for the aQuellé Tour Durban presented by Bridge Fund Managers will enjoy a full 100km route laid out for them on the iconic main road race, on Sunday, 28 April. The organisers have confirmed that the new start loop will now turn at Swapo Road (formerly Broadway) instead of turning at Riverside Road as was the case last year, adding that this was purely to bring the race distance up to 100km. ”Last year, the race route was tweaked to shorten the final out-and-back leg on the M4 to turn at Mdloti instead of Desainager Circle to minimise the impact of road closure on the local residents in that area. To make up for the distance lost, a start lap along the coastal M4 route was added in. The route worked well but after the race we saw the total race distance was 97km, and all the classics aim to be 100km,” said race route director Andrew van Rensberg. “We will keep the same format but simply ride up to Swapo Road (formerly Broadway) and turn there before heading back into the city via Masabalala Yengwa Avenue (NMR Avenue) and onto the familiar route that takes the riders out to the M4 Southern Freeway,” he explained. Van Rensberg added that start lap was well accepted as a chance for the peloton to warm up and ease into the ride. “The attacks come later, particularly on the climb up to Pinetown,” he explained. The routes for the popular 45km ride that uses the M4 to Mdloti and back will remain unchanged. Van Rensberg said that small changes will be made to the 55km ‘cyclocross route that is aimed at mountain bikers, hoping to incorporate new sections of single track on the three 5km sectors off the M4.